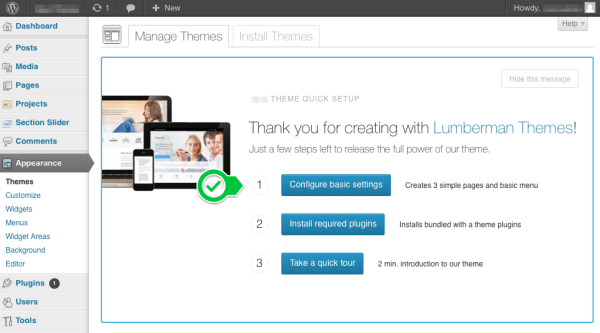 Click “Configure basic settings" if you have a clean WordPress installation with no menu and home page created. After you click this button our theme will automatically create 3 simple pages (Home, Portfolio and Blog) and basic menu. We recommend this step for all novice users who is not sure how to setup main page, blog section, portfolio section or how to attach a particular menu to the menu area. Skip this step if you are experienced user, have site content already setup and know well how to change the main or blog index page settings, create and attach menu. NOTE:This step will not delete or change in any way your current content (pages, blog posts, menus). It only create 3 new pages and change some settings, that can be reverted/deleted in the future. Next step: Now please install and activate required plugins.